Greetings again from the darkness. Mid-life crisis has long been a popular movie topic. A list of the best would include: Fellini’s 8 ½, Blake Edwards’ 10, AMERICAN BEAUTY, CRAZY STUPID LOVE, SCENES FROM A MARRIAGE, THE BRIDGES OF MADISON COUNTY, THE SEVEN YEAR ITCH, and THELMA & LOUISE. Some of these are outright comedies, while others are turbulent dramas. With the label ‘white male privilege’ being applied so broadly these days, it’s impressive how writer/director Mike White (THE GOOD GIRL, SCHOOL OF ROCK, creator of TV’s “Enlightened”) so expertly and gracefully takes on the familiar topic. Ben Stiller stars as Brad Sloan, a married man raising a teenage son and running a Non-Profit Organization in middle-class Sacramento. 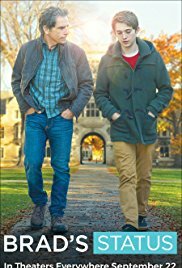 As Brad and his son Troy (Austin Abrams, PAPER TOWNS) embark on an elite northeast college visitation trip, we get the sense that Brad is only now waking up to his son’s rapid approach to adulthood and remarkable talent as a student and musical prodigy. This happens congruently to Brad’s mid-life realization that his own college buddies are richer and more famous than he. Self-loathing, insecurities and concern over the jealousy he feels towards his own son are the focus of Brad’s inner thoughts, which we hear courtesy of his narration. Brad’s college friends who are unknowingly driving his defeatist attitude include: Jemaine Clement as Billy Wearsiter who retired in Hawaii at age 40 after selling his tech company; Mike White (the film’s director) as successful movie director Nick Pascale whose house is featured in Architecture Digest; Luke Wilson as hedge fund manager Jason Hatfield who married into money; and Michael Sheen as Craig Fisher, a best -selling author and frequently seen on TV political commentator. In comparison, and by today’s societal levels of achievement, Brad views himself as a failure – a man whose early idealism didn’t change the world, and instead prevented him from reaching the capitalistic heights of his friends. There are a couple of elements that allow the film to work. First, Ben Stiller softens his usual snark, making him more relatable than his usual woe-is-me character. Next, the film isn’t as harsh on the white man as we’ve come to expect. There is no feeling sorry for Brad, but there is at least compassion … space for him to explore what he’s feeling and take stock in his life. The difference maker is Mr. White’s script. The underside of human nature is explored with a deft comedic touch and incisive societal observations. Stiller’s tightly wound Brad contrasts with Troy’s easy-confidence leading to some unusual father-son scenes. When Troy questions whether his dad is having a breakdown, we understand that the existential crisis is actually fairly common. We certainly enjoy watching as Troy’s Harvard friend, and fellow musician Ananya (Shazi Raja) listens patiently before slapping Brad with the dose of reality he so desperately needs. Ananya’s beyond-her-years wisdom leads Brad to a moment of self-awakening during her concert of Dvorak’s “Humoresque”. Ms. Raja’s role is given much more weight than that of Jenna Fischer as Brad’s wife/Troy’s mother, who inexplicably only appears about every 20 minutes as a check-in during the boys’ trip. Keeping up with the Jones is a no-win approach to life, and if a Hollywood film can help a few more people understand this, then it’s a beneficial way to spend a couple of hours. The Mark Mothersbaugh score has a sharpness to it that mirrors Brad’s tarnished idealism and search for self. We are reminded that normal insecurities can blow up if we focus too much on what others have, and not enough on what we do. Greetings again from the darkness. Kristen Wiig, Bill Hader, Ty Burrell and Luke Wilson … prepare yourself for 90 minutes of side-splitting laughter! OK, well you can prepare all you want, but you should know that while there are some funny moments, this is one of the bleakest films of the year. Bleak as in achingly painful to watch at times due to the emotional misery most every character experiences. Hopefully no one stopped reading after “side-splitting laughter” because here is a sampling of thematic elements covered in the film: attempted suicide, suicide of a parent, adultery, sexual abuse of a minor, rampant lying, depression, horrific parenting, drug use, animal cruelty (goldfish). If Bill Hader and Kristen Wiig of SNL fame don’t spring to mind when considering those elements, please keep an open mind. Both are extremely good (and believable) in their roles as twins estranged for a decade, forced back together after a near tragedy. See, after a miserable childhood, their time apart has prevented both from establishing a strong personal relationship with anyone else. Hader plays a self-professed “gay cliché”, while Wiig is pretending to have the perfect suburban life with her gung-ho, always “up”, good guy husband (Luke Wilson). 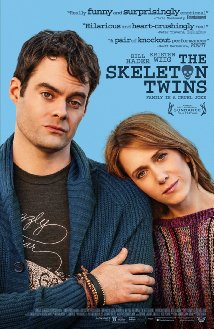 The film’s best humor is produced in small moments thanks to the connection between Wiig and Hader. It’s definitely not in the almost shameful attempts at crowd-pleasing offered in the SNL-ish scenes of lip-synching to Starship, and over-indulging on Nitrous Oxide at the dental office. Real emotional turmoil exists in the scenes between Hader and Ty Burrell, and the unnecessary and inexplicable reunion between Hader, Wiig and their mother (Joanna Gleason). Burrell, known for his outstanding “Modern Family” role, is intriguing as a dramatic actor. Looking forward to more of this from him. The script, co-written by director Craig Johnson and Mark Heyman, really does capture some poignant and dramatic moments, and certainly benefits from the extremely talented cast. Just don’t expect that side-splitting laughter … unless you are susceptible to lip-synching and/or nitrous oxide farting humor.